‘What doesn’t break you, only makes you stronger’, ‘Say no to relationships’, ‘Dreams don’t work until you do’, ‘Genius is a one percent inspiration and ninety-nine percent perception, ‘In the midst of chaos, there is also opportunity’ are often heard being quoted by warriors in suited armour within closed boardrooms. This fact is soon becoming fiction as suits are being replaced with boots and boardroom wars are being battled on sport fields! With days seeming shorter, meetings extending longer and life pacing faster, corporates are now encouraging teams to take to outdoor sports to lend a recreational pause to their gallivanting lives. Addressing this demand for short recreational activities, traditional games are being customized to meet modern business needs. The recent popular sport being played by the gutsy boys is Rink Football, the shorter yet enthralling version of traditional soccer. 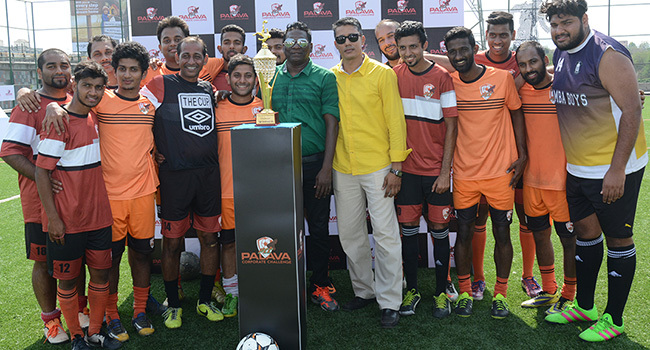 “Rink Football or Futsal was introduced almost a decade ago,” says Nitin Kanhekar, Head of Corporate Sports at SportzConsult, the management company who organized the first-ever Palava Corporate Challenge last week. The Palava Football Stadium saw 32 teams play Rink football and battle it out on the FIFA standard astro-turf. Rink Football is a 15 minute game played on an astro-truf between two teams of 5 players each. Each half is of 7 ½ minutes duration. The boundaries of the play turf are marked by walls and the goal post is smaller. Unlike the traditional format, the goalkeeper is not allowed to throw the ball back with his hands, there is no extra time and most importantly, there is no red card! For a game which heads into tie-breakers, the winner is decided directly by a penalty shootout. “This format can be further customized to make it more challenging by introducing rules such as not allowing the goalkeeper to defend using his hands, and keeping the goalkeeper floating. With the goalkeeper being rotated, the attack strategy needs to be constantly amended within limited time,” says Nitin. Highlighting another prominent reason for the popularity of Futsal, Nitin states that it provides an opportunity to introduce football to youngsters and enthusiasts and encourage them to experience the sport. “This provides a platform for professionals to identify potential talent which can be honed further. It is a boon for football scouts,” he says. Echoing the objective of this new format of football, Palava too aims to provide its citizens the opportunity and best suited facilities to experience sports, and identify their interest and strengthen them further. The Palava Football Stadium situated on the periphery of the city is furnished with a FIFA standard astro-turf and holds regular professional camps to coach football enthusiasts. Presently, the citizens of Palava are being trained by professionals from Kenkre Football Academy. The Palava Corporate Challenge brought together Corporate honchos to trade monochrome shirts and shoes for bold team tees and spike boots! The Palava Football Stadium was divided into 4 quadrants to simultaneously have 8 teams play together in the qualifiers. The matches were played under the keen watch of 10 referees from the Mumbai Football Association. The final was played between JP Morgan and Intelenet, with the latter taking home the winner’s trophy! And that day among the spectators, cheering the teams and watching the action was the ‘Black Pearl of Indian Football’, I.M. Vijayan! Befriend the wall – Keep the ball low and use the wall for rebounding shots and nifty passes. Attack is your best defense – Play fast rather than playing hard. The turf is quick so move quickly too. Play to live – With no red cards and unlimited substitution, go for the kill! Choose your shape wisely – Form the diamond, pyramid, square or Y, as best suited for that minute. Hi-five – Stay together in mind and unhinged on field.